The term “drug world” has been drilled into children's brain since the day they could feed themselves. It is supposed to scare children out of taking drugs to prevent addiction in the future. Although, it somehow is still overlooked how painstakingly true and devastating this world of drugs can be. Beautiful Boy does just this as it reminds the audience of the unapologetic consequences of falling into drugs, as we helplessly watch a son enter a dark world in which he cannot get out. What makes this movie unique is the vulnerability with the real story, “We worked on this movie for ten years. I learned to stand in the presence of two people, David and Nic, who are utterly committed to telling the truth. I think truth is a currency that is more and more valuable… we need to insist on our self rigor to tell the truth,” said Dede Gardner, co-producer of the film Beautiful Boy, after the showing of the film in New York City. Based on the bestselling memoirs by David and Nic Sheff, the essence of their two sided story of recovery is ingrained in the Felix Van Groeningen adaptation, Beautiful Boy starring Timothee Chalamet as Nic Sheff and Steve Carell as David Sheff. The story takes off from a rather rock bottom part of Nic’s life, but just as the audience thinks it cannot get any worse, the addiction drags Nic into being an unrecognizable monster as his family watches aimlessly on the sidelines. In 2005, David wrote about his son in the article for the New York Times magazine titled “My Addicted Son”. The addiction grew as did the family’s concern and involvement. The article ended on a seemingly hopeful note with the triumphant recovery. Sheff went on to write a memoir titled Beautiful Boy, which explained how Nic’s recovery did not last. Nic wrote a memoir that was published at the same time as his father’s was, titled “Tweak: Growing Up on Methamphetamines”. Through this voyage, it is made apparent that David’s fatherly love prevails as he continuously is there to pick Nic back up again and dust him off. In the parable the Prodigal Son, the son goes off with his father’s fortune and spent it all frivolously, leaving him poor and to live with the pigs. When the son returns, he is carrying nothing but shame and defeat, and comes asking for his father to hire him as a servant. Instead of being upset, his father runs to him proclaiming how his son has finally returned. Despite his son’s mistakes, he loves him. The film also seems to accomplish this same feeling within the audience through a display of unconditional love. David at one point had to tell Nic that he can no longer help him because it simply was not working. Nic disappears for a while until David gets a call saying that Nic is in the hospital because he overdosed. David goes to the hospital to see Nic barely alive. He helps Nic walk, with his arm wrapped around him and all Nic’s weight pressing against him, as they limp outside to sit in the sun. Through the ups and downs of recovery, the son needs his father’s love and his father will always love him. However, this is not to say that love heals everything. The film uncovers the possibility that although his father loved him and pursued him to no end, it did not keep Nic from falling into drugs once more. Love is not a ticket out of the world of drugs. Addiction is often portrayed as something that can be overcome if you try hard enough, but co-producer Jeremy Kleiner wanted to make it clear that this was not the case. “It felt like there was a series of myths about addiction. That addiction is a matter of will power, or that addiction is a matter of state of a moral character. Or that addiction is structured in a way that we understand, like it has a pattern or ups and downs. In the experience of these people’s lives, we saw a different reality that maybe be closer to the truth of it-- the authentic way that it actually happens. It is a disease and it does not discriminate, it affects people across the spectrum. It is a process that is not a straight line,” Kleiner said after the showing. This realization is an important pill to swallow and a large step to understanding what the road to recovery might look like. 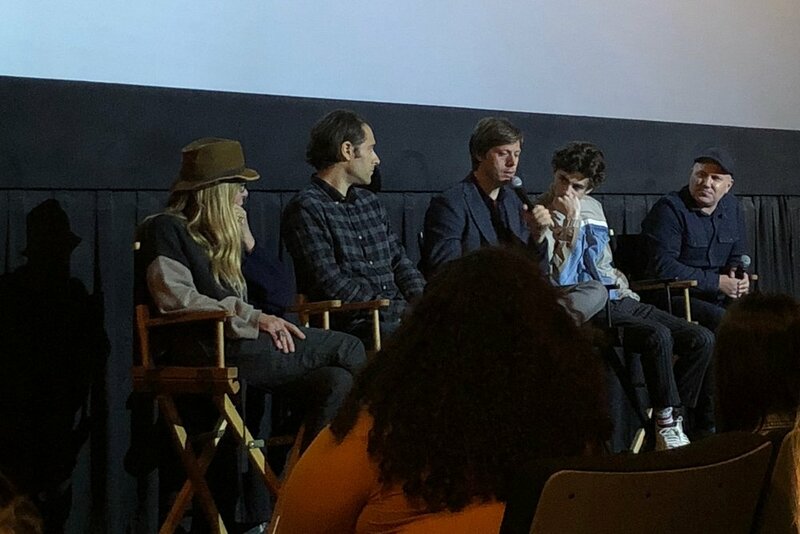 Chalamet spent a lot of time prepping for the role by talking with Nic about his life, “He [Nic Sheff] said he had many relapses, but he found puzzle pieces in each part of his recovery. He found things that worked in one part of the program and things that he took on with him and it was one of the more complex things about addiction. The more you know the less you know, there are some programs that work for people there are some that don’t… I know Nic, at least in my opinion, made it seem like it was not just a click. It was a little bit of this and a little bit of that,” Chalamet said during the Q&A post-showing. “It is a process that is not a straight line"
This story is new, but it is a narrative that we all know. We all know someone on that path or that has already been down it, or maybe you are Nic in this story. This story is not distant, but rather close to home. It is not some demon possessed child, but someone you know that has pulled away from you, disappearing into the drug world. This story is “A move towards unconditional love, a love without judgement, love as being there and being present,” according to Kleiner. The film leaves the audience on a dissonance ending tune, with no resolve, but perhaps that is the reality of the world of drugs.